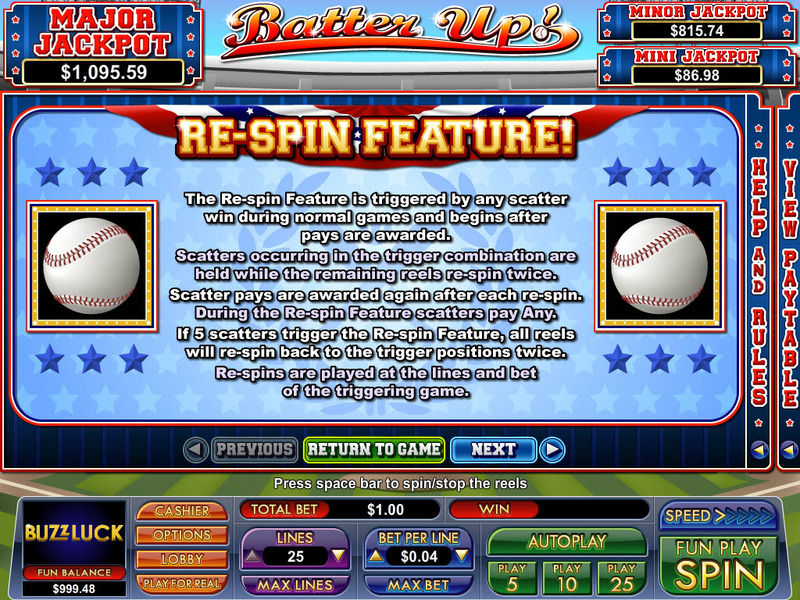 Overview: We're turning a slot machine lever into a baseball bat, buttons into bases, and every spin the chance to hit a legendary home run. 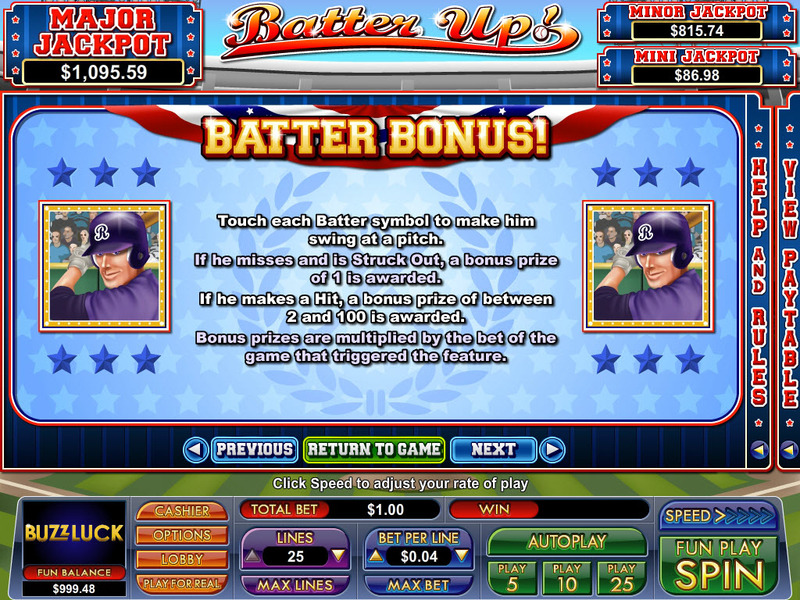 Drop some coins into Batter Up and play for your chance to take control of the entire baseball field in our legendary online slots game. 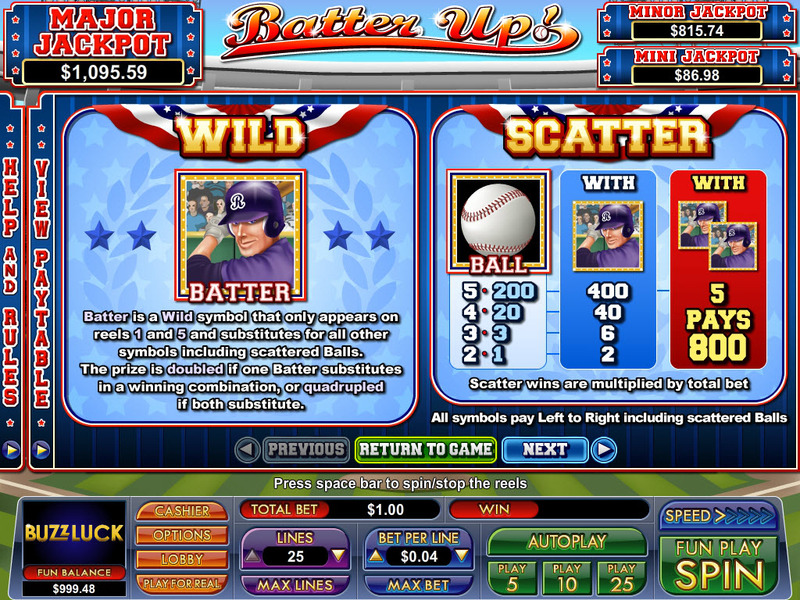 If you can survive 9 innings, you'll feel like the ultimate Slot Madness champion worthy of the league title. 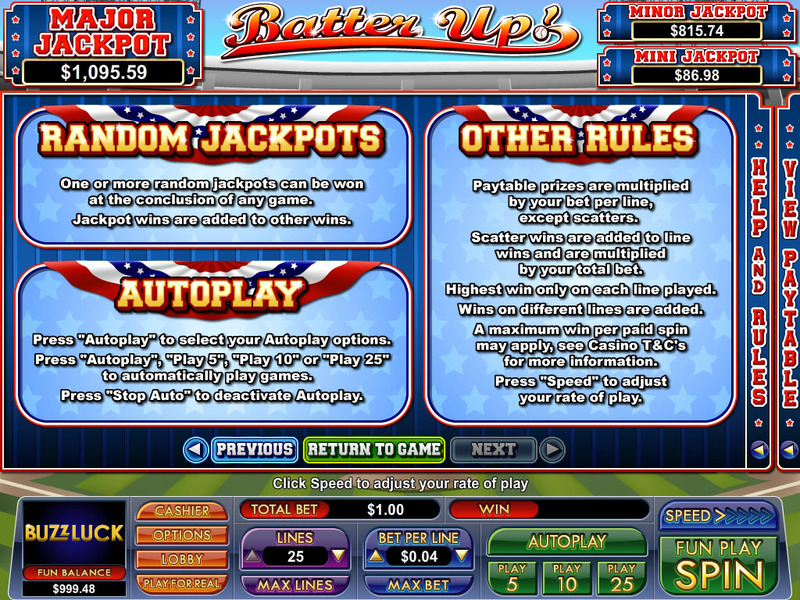 This 25-payline slot machine with 5 reels features everything you need to have the time of your life at the ballpark. Don't just sit in the stands eating peanuts and cracker jacks. 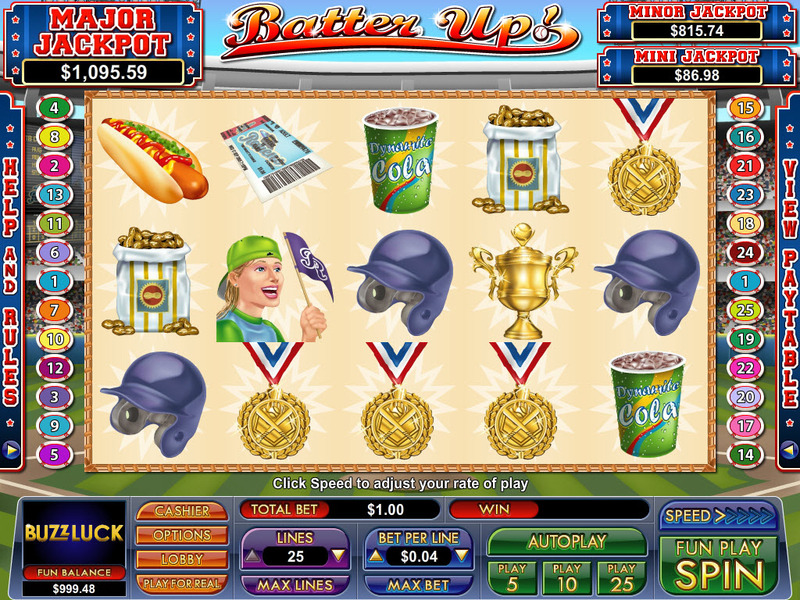 Grab your glove and step onto the field because Batter Up is packed with big chances to take down the home team. You can bet between $0.01 and $5 per line, and you can play between one line and all 25 lines for a maximum bet of $125 per spin. And that all adds up to huge potential to cash in. With great sound effects, fun graphics, and a 10,000x jackpot amount, your next grand slam could be just a spin or two away. 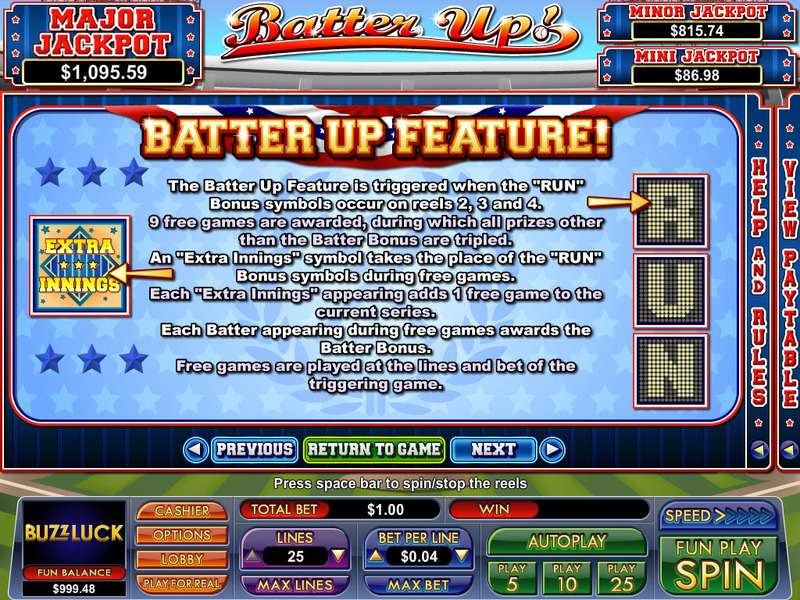 Batter Up features a special bonus game called the Batter Up Feature, which gets triggered when the bonus symbols R, U, and N appear on three reels at the same time. You'll get to play nine free games, on the house, with triple rewards. During your free spins, you'll see R, U, and N symbols replaced with an Extra Innings symbol, and you'll have the chance to score extra free games. 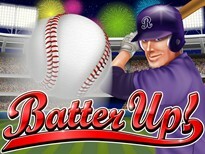 There's also a Batter Bonus, where you'll get to take a swing at a pitch for a chance to earn a grand slam bonus prize. 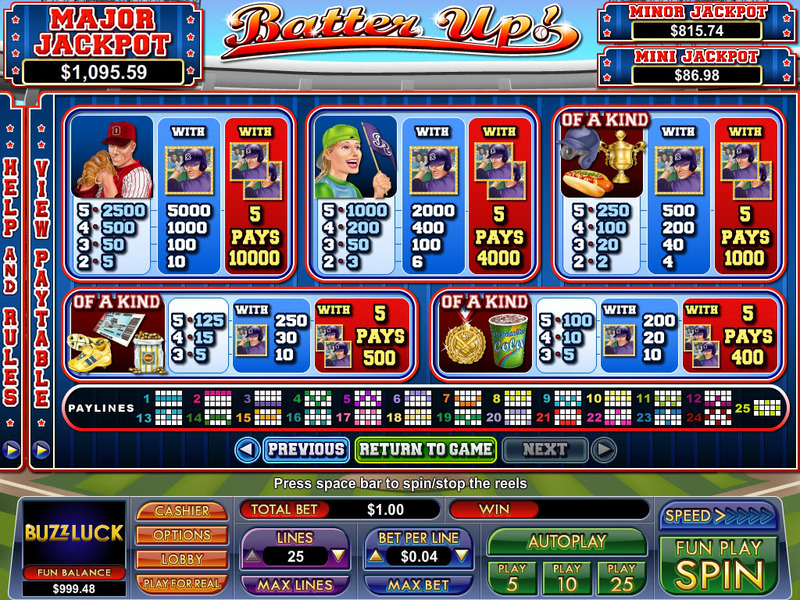 Similar Slots: If you like Batter Up, you might like these other slot machines from NuWorks: Babushka, Bank Bandit, Camper's Cash, Mammoth Wins, Monster Millions, The Heat is On!.